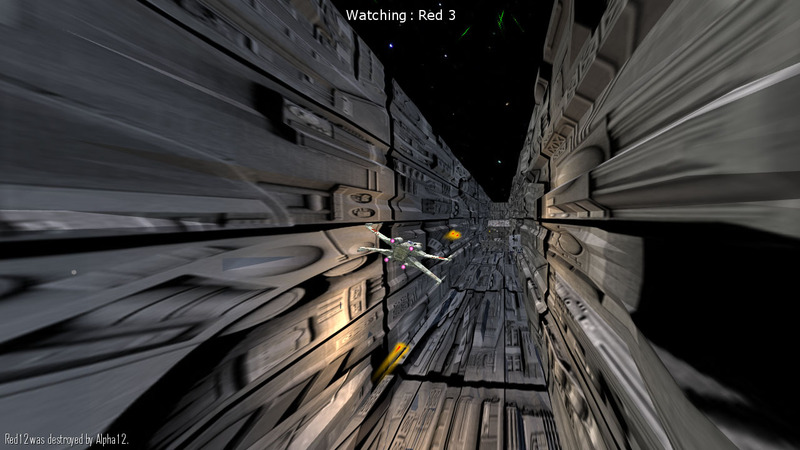 X-Wing Revival is a fan project to create a multiplayer combat space flight sim in the style of the Star Wars X-Wing games. When I started making X-Wing Revival in 2011, there wasn't much going on with Star Wars, and the X-Wing series of combat flight simulators seemed to be dead. I really wanted to have an X-Wing LAN party, but the last official game was X-Wing Alliance from 2002, which we couldn't get working reliably across modern Windows 7 machines. So, I decided to make my own! X-Wing Revival is intended to provide a multiplayer experience similar to the X-Wing and TIE Fighter games, but it is not an exact clone. The ships are faster and less shielded, making combat a little closer to what you see in the movies. A few solid hits will take down an X-Wing! The game was designed primarily for LAN play, where we have tested it with about 20 players in a game. But it can also be played solo against bots, or online -- the host just needs to map TCP port 7000 on their router's NAT. Now with VR support! I've only tested with the HTC Vive on Windows 7, but it uses OpenVR so it should work with any SteamVR-compatible HMD. See the readme for tweaking options if it looks strange on an Oculus Rift or other headset. Right now the default game mode is the Battle of Yavin trench run, in which the Rebels must fly down the Death Star trench and try to hit the exhaust port with a torpedo. The Empire has to make sure the Rebels don't achieve this before the time limit runs out. In Capital Ship Hunt, one team must defend their capital ship while the other team tries to destroy it. The defenders win if they can keep their capital ship alive until the time limit hits. In Defend/Destroy, both teams have capital ships. The last team with a surviving capital ship is victorious. Or for something a little more simple, you can select team elimination or deathmatch mode. And there will be many more modes coming in future versions! There's also a Windows screen-saver module included that lets you watch bots duke it out in a never-ending team deathmatch. Source code for the game and its engine are available on my GitHub page. Note for Mac OS X 10.8+: To run X-Wing Revival with Apple Gatekeeper, open the System Preferences, go to Security & Privacy, then set Allow applications downloaded from: Anywhere.